50,000, 100,000, 250,000? More??? How does 1 million components sound? Bridge tooling, soft tooling, pilot production, semi-production, market testing, gap testing, etc. Called by any name it still is pre-production quantities for plastic products with volumes that may need millions of parts. Keep in mind, that all customers needs are different, and PHOENIX PROTO has the experience to accommodate. A 1,000,000 product life expectancy can be achieved with Aluminum cavities. Often for higher quantities using bridge tooling is far more cost effective than a Steel Alloy due to faster builds and cycle times therefore reducing the mold and piece price. So a plastic part that normally would be built in a Steel Alloy can be had at a greatly reduced cost of the same or superior quality when Aluminum is used as a bridge tool. One major OEM just did a recent study proving Aluminum Tooling value and durability in production. In one instance we were able to take a doomed project made out of Steel and turn it into a success using bridge tooling. We were able to produce 800,000 parts off of this bridge tool, that amount by some standards is definitely production quantity. This tool saved our customer over $100,000, learn more about Aluminum Tooling savings from this case study. The type of plastic prototype chosen is important in how successful the project will be in closing the “gap” and crossing into full production or a new design. Rapid injection molding can help save a project’s timeline via bridge tooling. Frequently in this business climate, designers and engineers are forced to go with the cheapest plastic prototype. While there is an initial cost savings, over the long run often this cost savings is lost due to nothing being learned in beginning stages beyond fit and function to help troubleshoot possible process issues in full production. 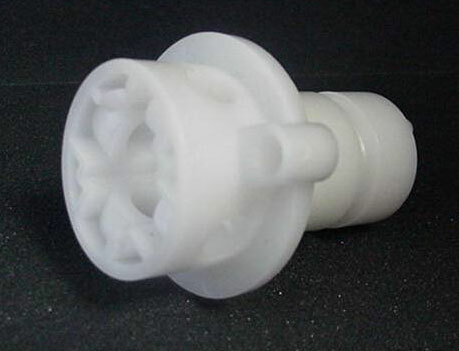 Additive (SLA) and Subtractive (CNC Plastic Machining) techniques for rapid plastic prototyping may be cheap and fast, however there is a downside in design limitations and fewer resin choices. For less robust designs this compromise is not an issue. But more often than not it becomes an issue at production time, and the costs involved with working out the kinks and tweaking the tool to achieve optimum production cycle times erodes those initial cost savings. The beginning of production is not the time to figure out that parts of the component aren’t filling correctly or an important design change is needed. Not to mention the delay between pre-production parts and production parts can be a costly oversight. This is when having an Aluminum mold to use as a bridge tool can be a project blessing. In first to market manufacturing, any delay can mean less of a market footprint. Aluminum Tooling gets product out into the marketplace faster. Bridge tooling with Aluminum and Aluminum Alloys is an excellent way to side-step and avoid this possible issue. You can create a plastic prototype that often does not cost much more than an Additive or Subtractive short run technique. You can get the design, resin and amount of product needed up to 1,000,000 units. And bulk runs brings the piece cost down even further. You can also group several similar parts together on what is known as a family tool for greater savings. Plus design tweaks are easy and cost effective. 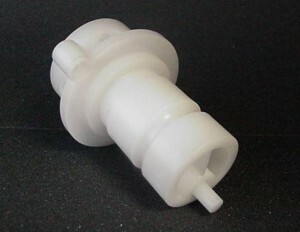 Soft tooling (Aluminum) allows for easier changes to the design and mold. In addition to our over 35 years of tooling experience which includes Aluminum tooling builds before anyone else thought it was possible. We have a scientific molder on staff. That means any processing issues that arise from design, resin selection and other process issues can be solved quickly and efficiently. So if the design is being finalized for full production, the production tool will be better equipped to “plug and play” from the early learning process. Designing for manufacturing is just as important as designing for aesthetic reasons. However, often the production process is an art form. A plastic part can be designed by the book, the perfect resin for the application, and still experience every little problem that can plague a plastic prototype | production process. Our on staff master molder can make this process less painful and time consuming. Aluminum tooling is low in cost and can provide up to 1,000,000 components. Case hardening can produce higher quantities beyond 1 million. Great low cost alternative to steel tooling for lower production quantities. Grouping similar components together in a family tool allows for greater cost savings. Can be run separately or together. Greater freedom in design and resin selection. Benefit of learning how design and resin selection will perform in a production environment. Design enhancements are fast and cost effective. If you are still not convinced of how bridge tooling with Aluminum can be a cost savings for your project(s) we offer more traditional Steel Alloy tooling.